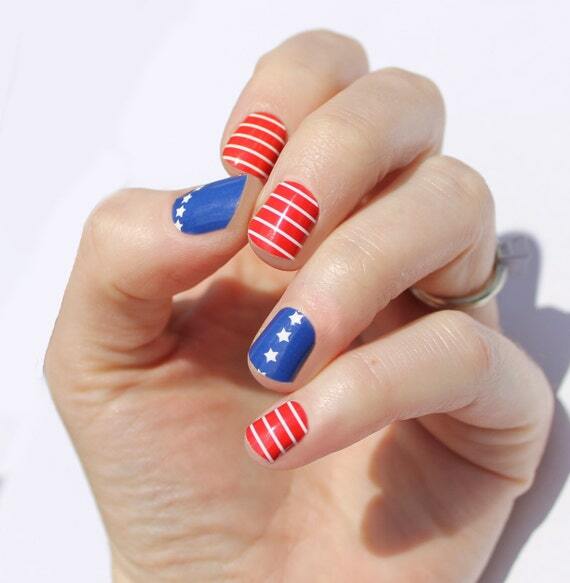 Happy Early Fourth of July! Saturday will also be one year to the day of my first How to Wear it Wednesday post. Whoo hoo!! 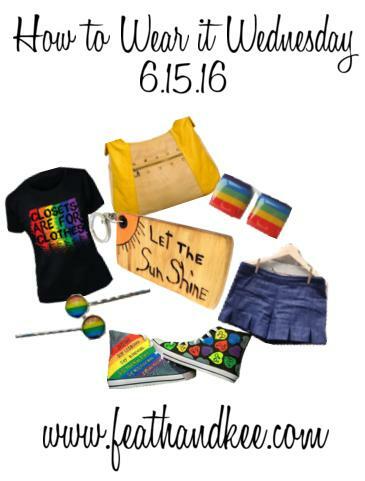 :) So this week is a fun weekend or weekday outfit for the lake, pool, water park, or backyard. 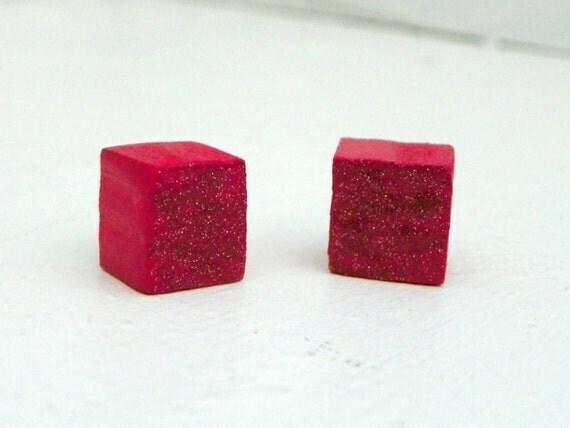 These glittery earrings from our shop are made from reclaimed wood. I painted them with acrylic paints, adding glitter for sparkle. By pass the struggle to find the perfect fitting bathing suit with this wrap suit from hisOpal. 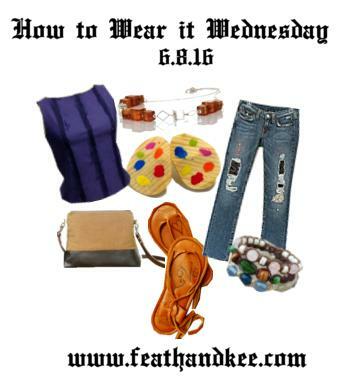 It is one size fits all, and you can wear it tons of different ways! If you are wanting cute nails, but don't have time for a manicure, then these wraps from SoGloss are just what you need. The fact that you just have to use heat to apply and remove them may have you hooked! I love this charm necklace from SaR Plata y Gemas. 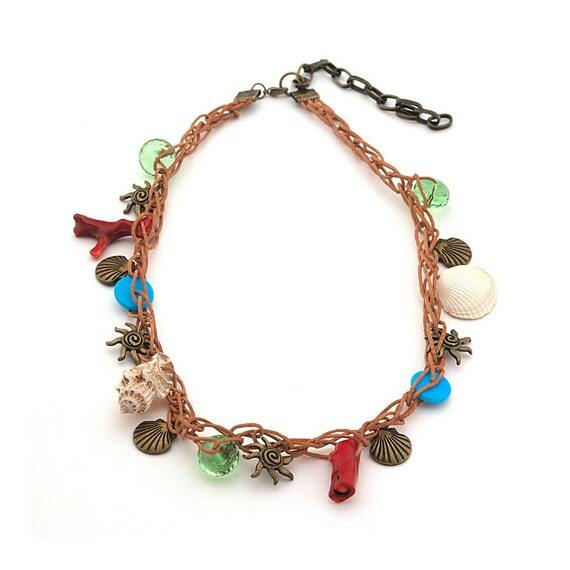 Red coral and sea trinkets are woven among a leather cord. This messenger bag from Ikabagsis made from canvas that was woven just for the maker. You can choose from a variety of straps. 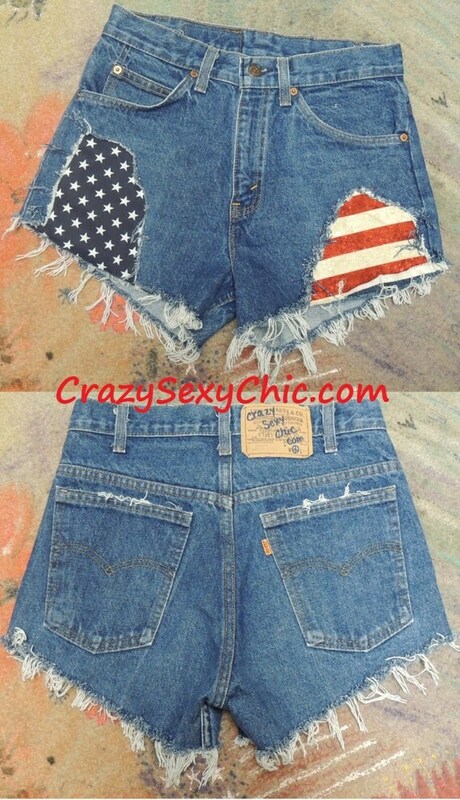 These one of a kind shorts from CrazySexyChic were made from recycled Levis, that were cut and distressed. Cute patches made from recycled fabric and reinforced with denim. 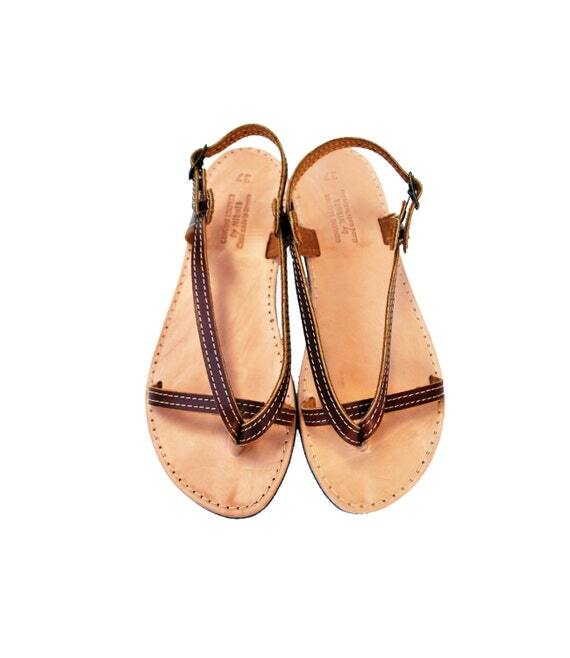 Made from 100% leather with a vibram sole, the "Charlee" Sandal from Amber Rae comes with one set of glass beads. They have other colors available to purchase here. 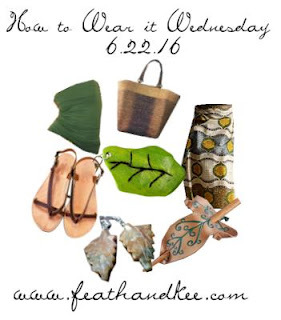 Grab a few different sets, and these will be your go to sandals. Finally uploaded content for Feath & Kee's You Tube Channel! I set up a You Tube Channel for Feath & Kee a really, really long time ago. I kept waiting to have time to master the process of creating a video. Well, I can be patient, but decided what the heck, and just made a couple. I needed to make some new fabric labels. Forgive the shakiness etc., this is definitely a work in progress! Whew! It. Is. HOT!!! lol Sorry about that y'all, but no matter how much you think that you are ready for Summer here in Texas, you are never completely prepared when it hits. 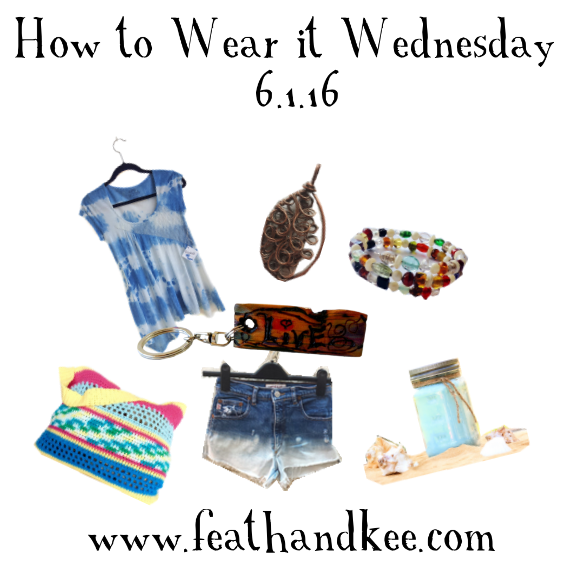 This week, I put together an outfit that I think will at least make you look cool. Thanks to the rain that we have had, everything is still green despite the heat. 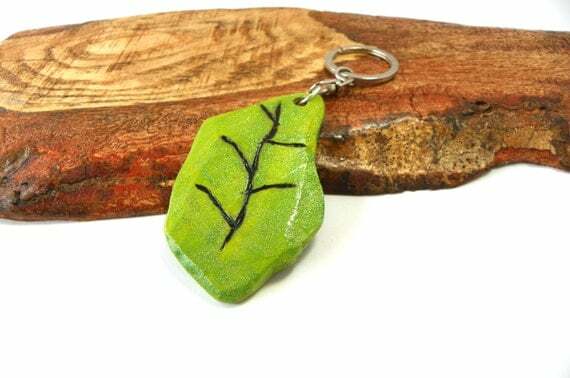 This key chain is a new addition to our shop, and was inspired by all of the green leaves. I started out with reclaimed pine, burned the veins, then finished with acrylic paint. Before I sealed everything with clear acrylic, I added a layer of green glitter, so has some sparkle. 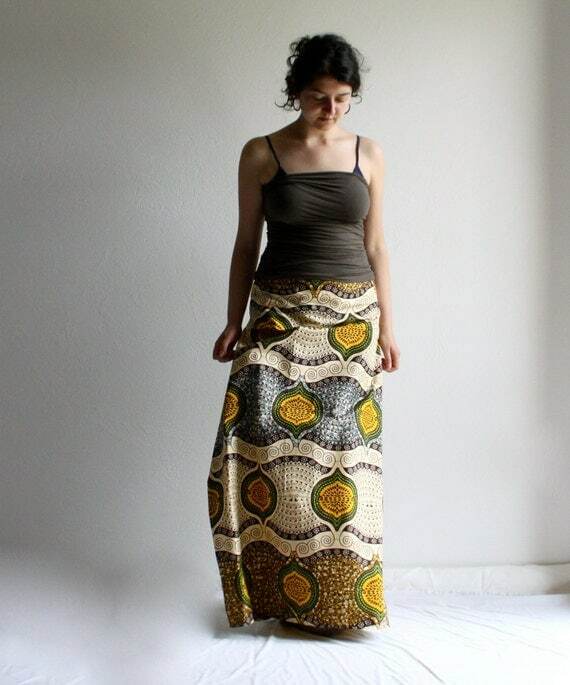 African wax printed cotton was a perfect choice for this Tibetian inspired skirt from LoreTree. The skirt's design allows it to be adjusted specifically to you for a perfect fit. 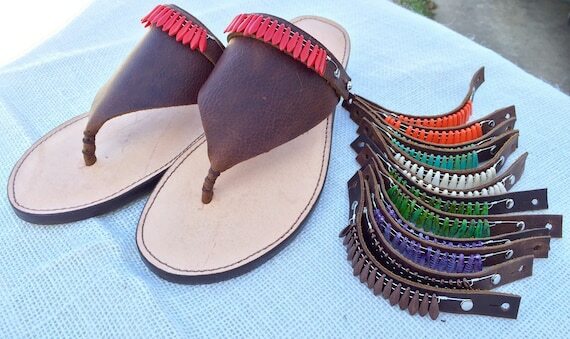 These made to order sandals from Nikola Leather Goods can be customized with a variety of colors. They are made from cow leather with rubber soles. 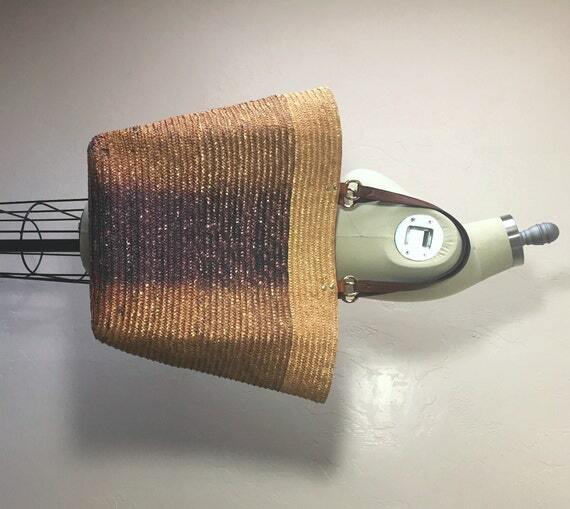 karenlukacs took a sisal straw tote that was on it's way out, and completely re-did it. I love the sturdy leather handles that she gave it, as well as the beautiful new lining. This is just a great bag! 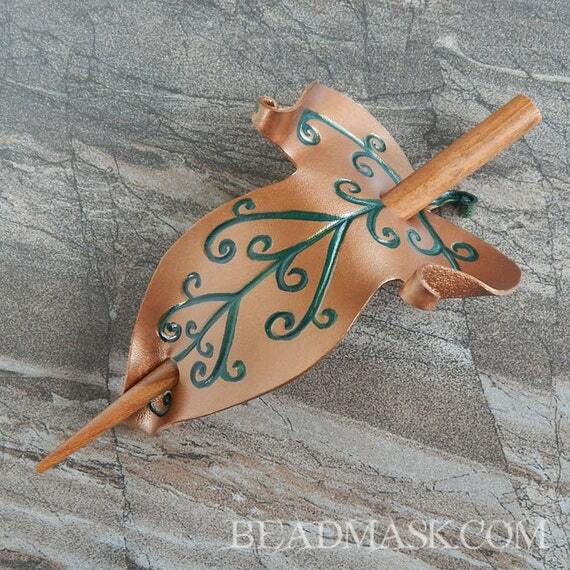 Sculpted from leather, then painted a metallic rust, this leaf hair slide Beadmask is just the thing to keep your hair tamed. 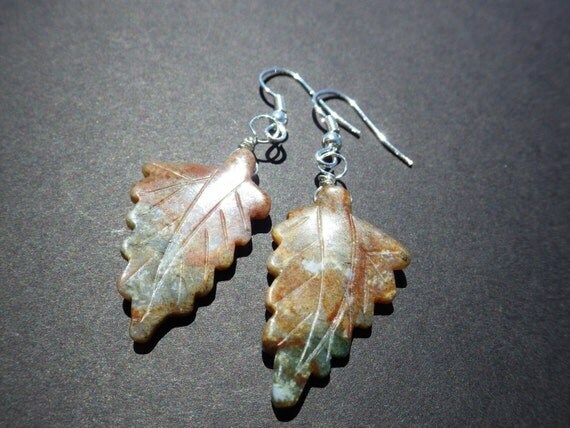 These hand carved Jasper leaves have been fitted with silver plated French wires to create a beautiful pair of earrings. Find them at CassieVision. 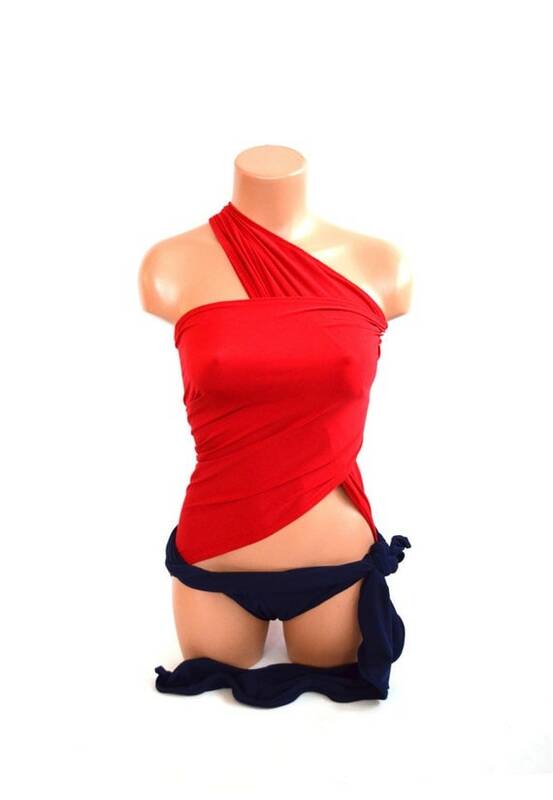 This versatile tube top from Soul Role was made from an organic cotton / soy / spandex jersey, giving it tons of stretch. 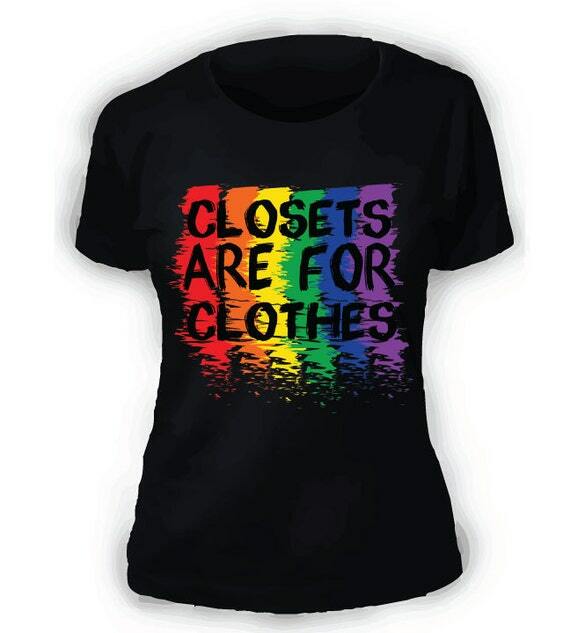 It is available in many different colors. As I put this week's post together, am still grieving for the victims of the Orlando shooting. This week's outfit is about love, equality, and celebrating life. 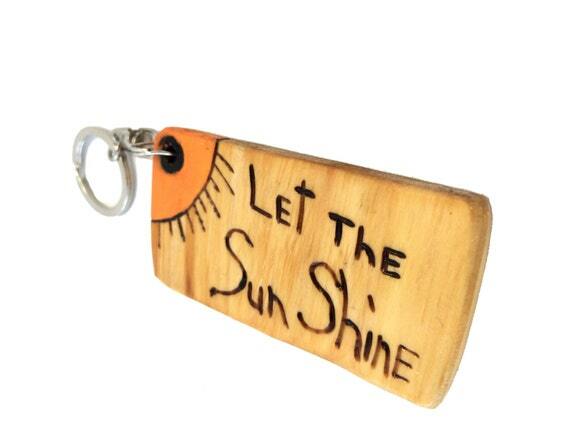 "Let the Sun Shine" is brand new to the shop this week. On one side, it has the positive message reminding you to live in the moment. On the other side, I drew flowers. 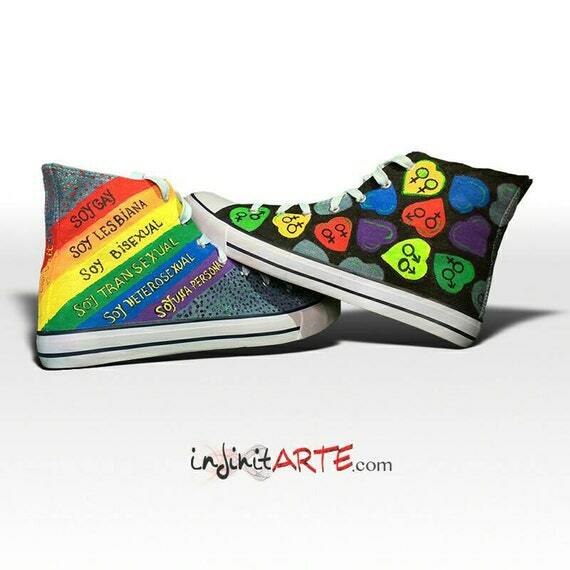 This neat pair of custom painted shoes from infinitARTEcom have been painted with a water proof textile paint, and sealed with a clear varnish to protected them. I love the message on this shirt from Digital Coast Designs. Remember to be yourself! These denim shorts from Little Birdie NYC are so cute! The pleats at the legs and side zipper help them to stand out from the crowd. 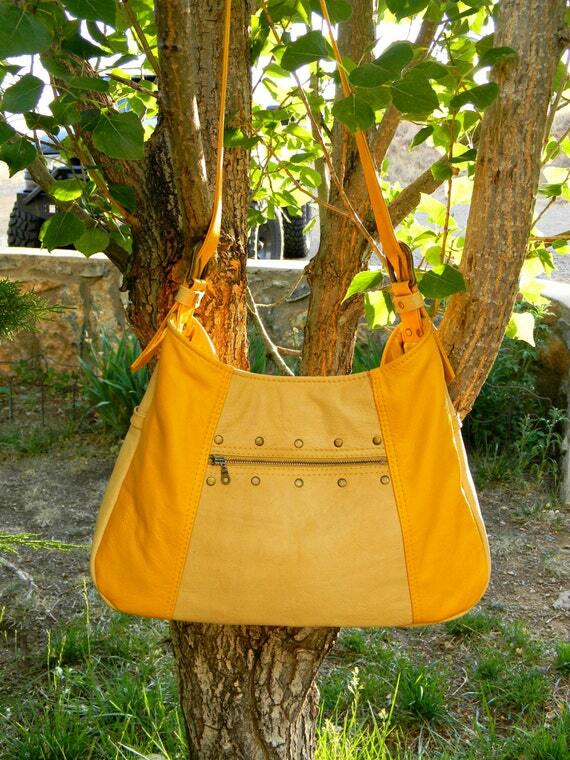 This bright yellow bag from AllasOriginals was made from leather and lined with cotton. 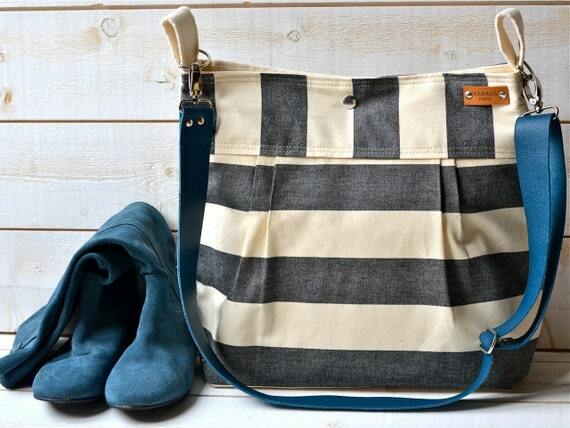 It has tons of pockets stashed throughout the bag to keep everything organized. 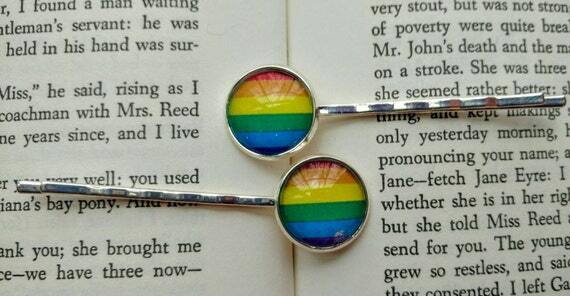 20% of the sale of these bobby pins from TheGreenSorceress will be donated to the True Colors Fund that works to end homelessness among LGBT youth. 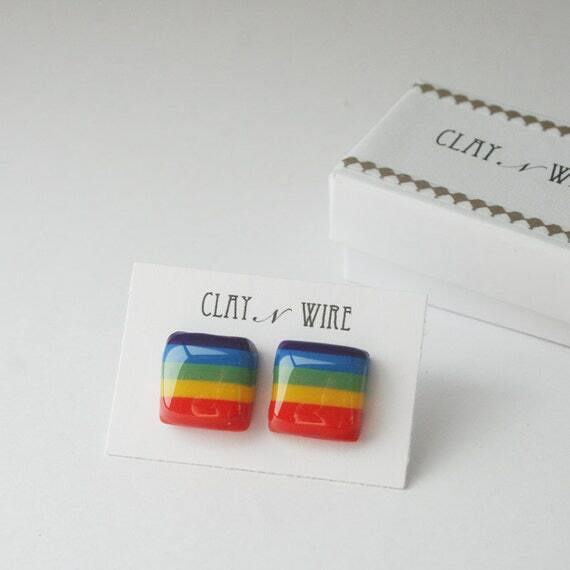 These beautiful earrings from Clay N Wire are made from polymer clay and resin. For the rest of June 2016, 100 % of the sales will be donated to the GoFundMe account set up for the Orlando Shooting Victims. So this is it for this week. Remember to keep love in your heart, because it truly overcomes all in the end. A fun, casual, eco-friendly outfit for this week. 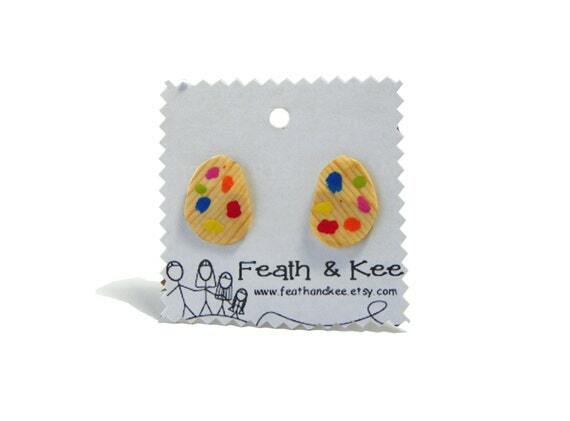 These fun earrings from our shop would be perfect for an artist. They are made from reclaimed pine. 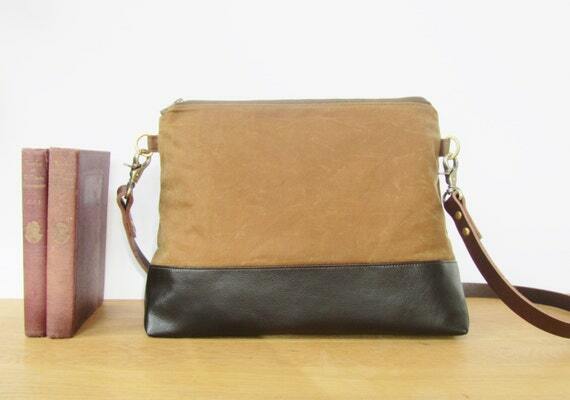 This great bag from Lunablue Bags was made from waxed cotton and vegan leather, with a leather strap. It has great storage and a waterproof lining. 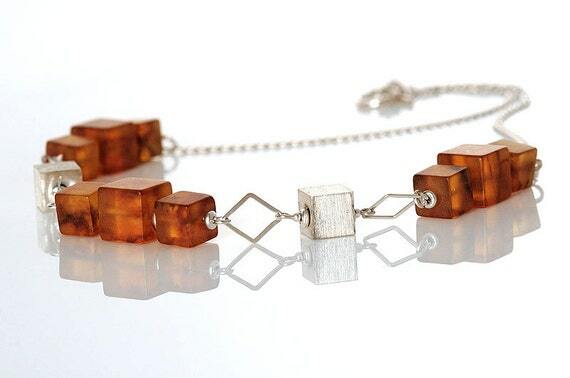 Baltic Amber and Silver cubes mingle well together on this necklace from Anna Bujak. 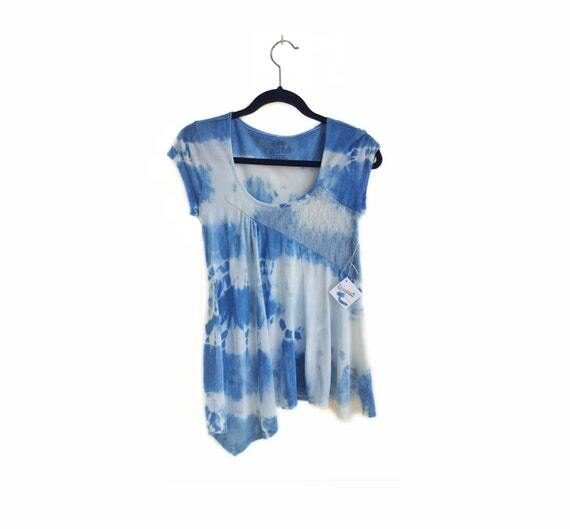 Distressed out seams give this top from Dinwiddies an original take on the traditional shell. 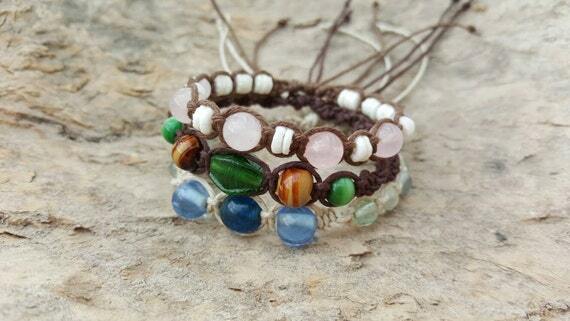 Earth friendly hemp joins up with beads made from glass, quartz, fluorite, and puka shells to make up this set of bracelets from Creative Earth Jeweler. 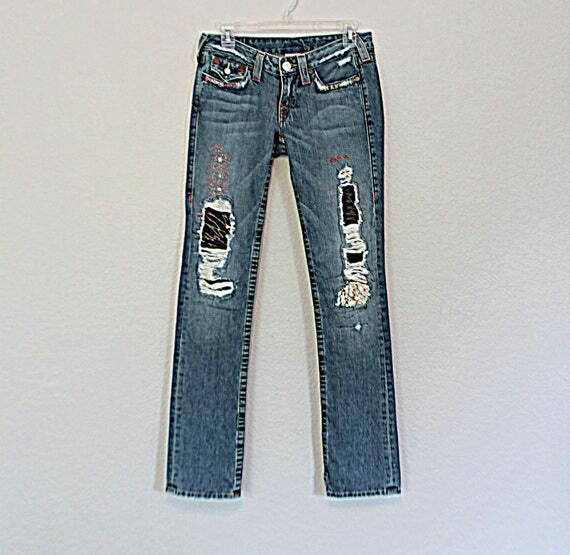 Up-cycled Jeans from Reloved Clothing Co. 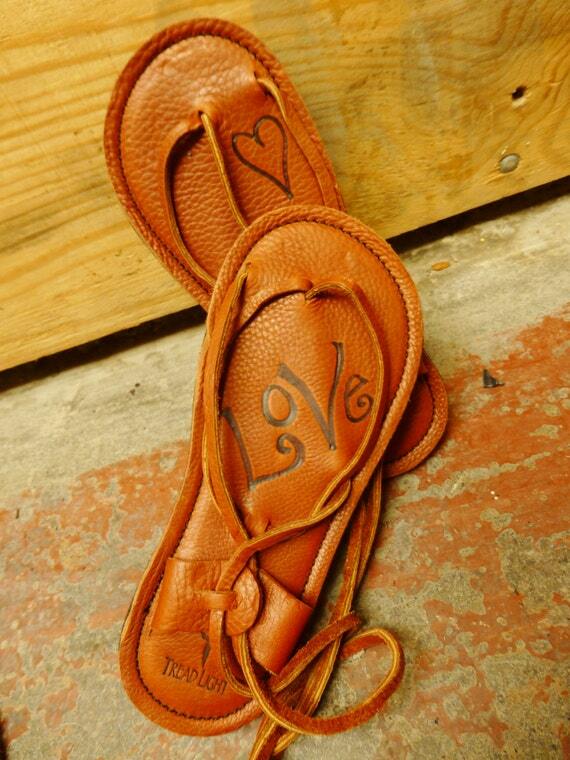 This pair of True Religion Jeans have been given a new life with customization from Reloved Clothing Co..
Personalize your Maori sandals from Tread Light Gear with your own words. I love the simple design of these. Hi guys! Not only is this the first day of June, it also happens to be the first week of Summer Vacation for us. This has put me in the mind to put together a Summer outfit. Everything featured this week is from TEMPT Team members (awesome group of people) on Etsy. You can check out all the member shops here. 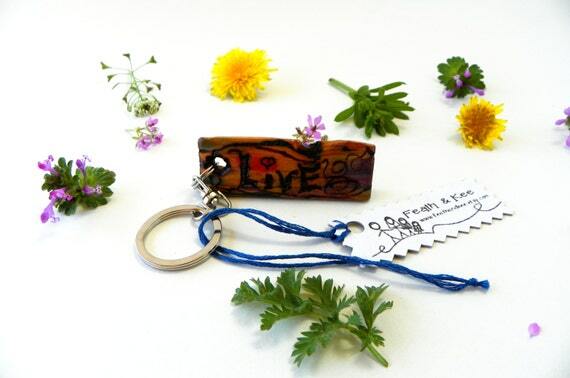 The item from our shop this week is a positive message key chain that really just took on a shape and form of it's own. After burning the design, it really seemed to be missing something, so I added a light stain of acrylic paint. These cutoff shorts from AbiDashery were made from a pair of thrifted jeans. 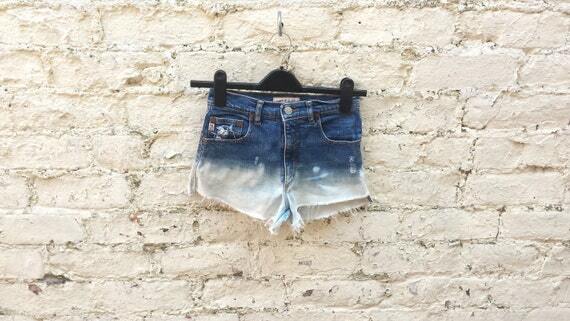 Abi has distressed and dip dyed them for a truly custom pair of shorts. 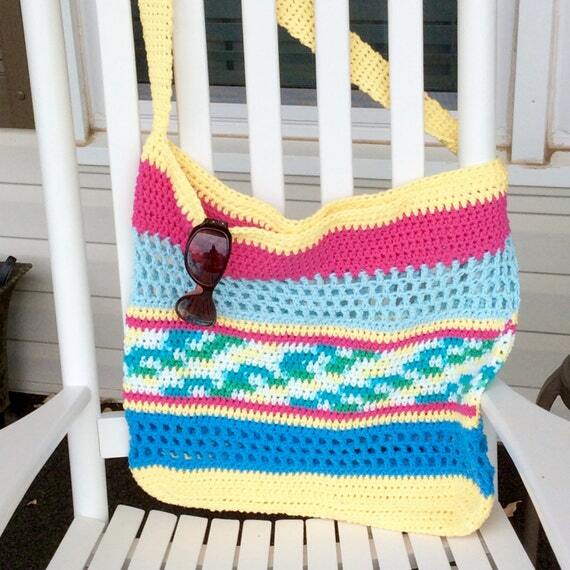 You can throw everything in this bright tote from Loopy Chic Crochet. It is made from 100% cotton and is ready to ship, so you can have it ready to go to the lake, beach, pool, or grocery store in a matter of days. 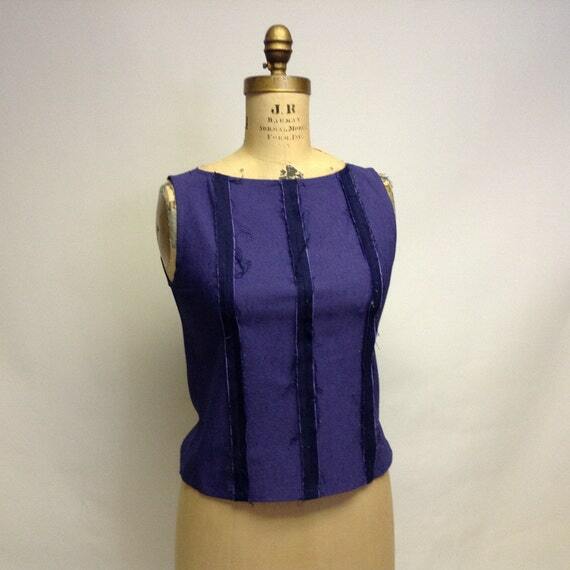 This shirt from BethRejuvenate has received a second life after a Shibori wrap and an indigo bath. I also love that while this shirt might have started out as one of millions, it is totally one of a kind now. 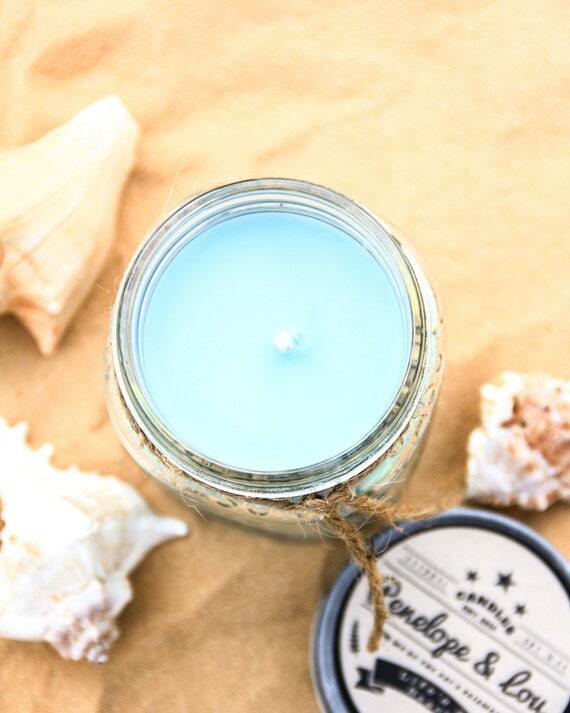 What a better way to gear up for Summer, than with the Life's A Beach candle from Penelope & Lou. All of their candles and wax melts are hand-poured from soy wax. In addition to being way better for the environment (and you! ), I have recently learned that soy wax is a lot easier to clean up than regular wax. In addition to their Etsy shop, you can also find them here. 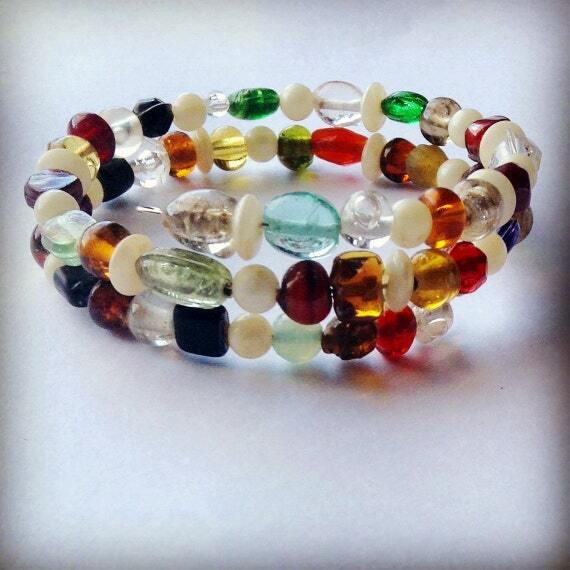 I love the beautiful carnival of colors of this beaded bracelet from Stink "N" Cute Creations. It is made with memory wire, so you can adjust it to get the exact fit and and effect that you are looking for. 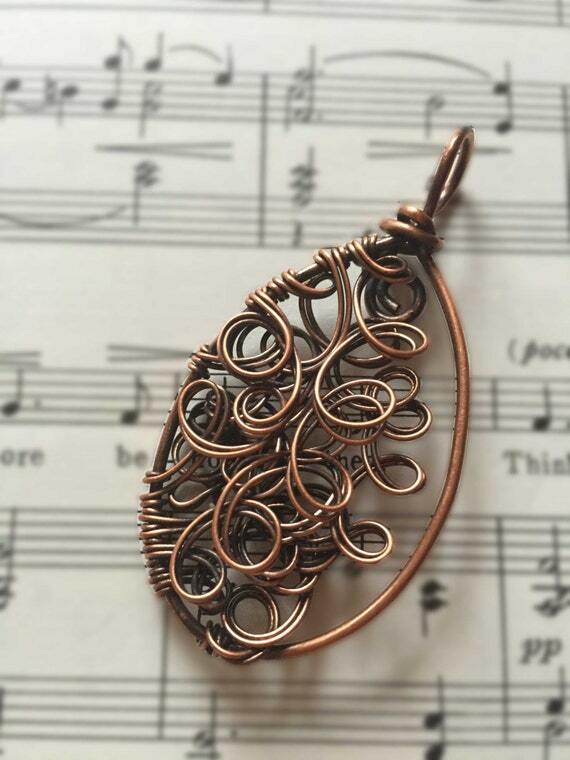 The intricate swirls and curls of this pendant from Karen J Jewelry have been made from oxidized copper. I don't believe it would be possible to replicate this one of a kind piece. It comes with a leather cord.